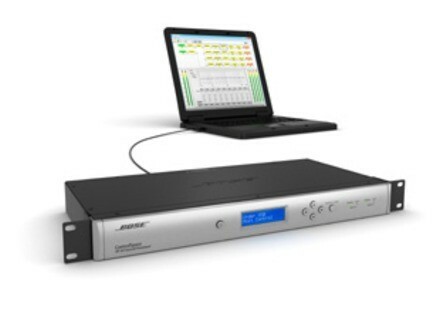 ControlSpace SP-24, Dynamic Processor from Bose. A new sound processor from Bose is being launched at PLASA 2012. The new Bose ControlSpace SP-24 is designed to simplify audio DSP for 2x4 installed and portable applications by offering two methods of configuration based on user preference and loudspeaker type. System setup is achieved using front-panel LCD menus and controls, which offer a basic method of configuration for systems using Bose loudspeakers. Factory-installed Bose loudspeaker equalisation curves are selectable, together with common routing configurations. Additional settings, such as gain and delay, are also available from the front panel for basic system tuning. Using the SP-24 Editor software, additional signal processing parameters are available for system equalisation and optimisation. For unique signal routing and processing configurations, or when used with non Bose loudspeakers, the SP-24 sound processor in combination with the SP-24 Editor software serves as a general use DSP processor. The SP-24 sound processor includes standard XLR connections to interface with balanced pro audio gear. It offers 2 input channels for sources such as mixing consoles, and 4 output channels to connect to amplifiers or powered loudspeakers. Additional features include input signal and clip LEDs located on the front panel, and a lockout mode, which helps prevent unauthorised access to the front panel. The SP-24 is suited for applications such as basic loudspeaker installations in auditoriums, houses of worship, and venues with live music performances such as bars and nightclubs, restaurants and retail. Additionally, the ControlSpace SP-24 can be used for auxiliary zones in larger system installations and with portable sound reinforcement systems. The SP-24 Editor software provides access to signal routing and signal processing settings, whether live or offline. Using the SP-24 Editor, custom scenes can be created and saved locally to a PC or, using a USB connection, stored to the processor. The SP-24 Editor is designed for operation on most 32- and 64-bit Windows based PCs and will be available for download at pro.bose.com. [PLASA] Yamaha Dante-MY16-AUD Yamaha announces updates to its Dante-MY16-AUD interface card. Elysia Nvelope Rack elysia announces the release of a rack version of their nvelope impulse shaper. Gemini Audio Releases NVE PRE 73 Gemini Audio Releases NVE PRE 73, a library for Acustica Audio's Nebula plugin.